Adding and customizing UIButtons in storyboard is extremely easy (and I would recommend doing it that way whenever possible), but what if you need to do it yourself in code? Once you get the button make sure you add constraints (if needed) and action and you’re good to go! That’s one of the most fun and easiest animations you can do. First, let’s make sure we know what constraint to change: you’ll have to make sure you either have the constraint as an @IBOutlet or -if you’ve added in code- make sure you add an identifier to it. It’s very important that you’re triggering layoutIfNeeded() for the parent view of the view you’re changing the constraints on. And that’s it! What I was trying to do was adding cells at the top of my tableView without any scroll taking place, similarly to what Twitter, Tweetbot or Twitterrific apps do. Green cells in the “After” scenario show how the new cells have been inserted at the top, without affecting scrolling. Step 1. 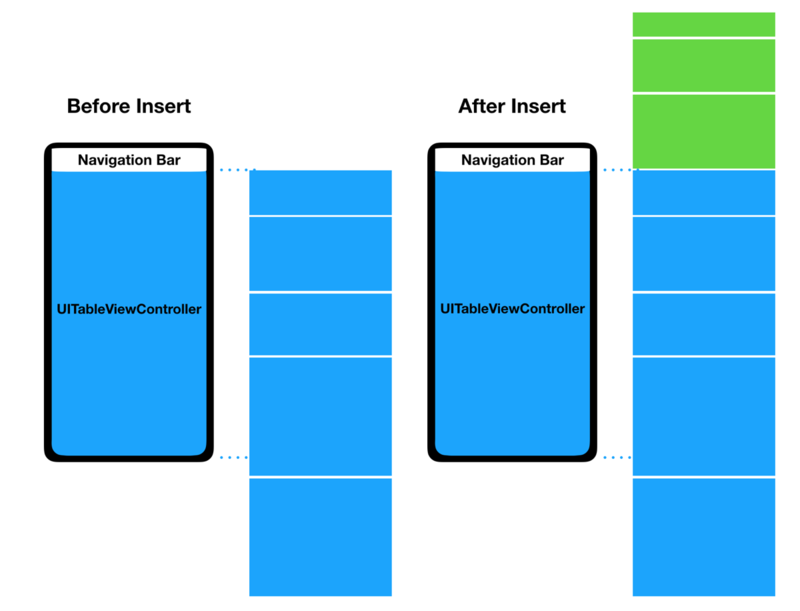 Storing in a variable the UITableViewCell below the Navigation Bar and storing the offset of that cell in relation to the Navigation Bar. Step 2. Insert cells / reloadData. Step 3.Scroll to the cell we saved before the insert/reload and then add the offset. PS. On another topic, if you get some jumpy scrolling with Dynamic Height cells I strongly suggest you to look into this question from Stack Overflow. This is a very quick one. For an app I’m working on I wanted to measure how long it took a given function to complete. From time to time I discover a new way of coding something that significantly improves readability & minimizes how much I need to code. Here’s one of such latest discoveries. Typically to find a value in an array (or in an array of dictionaries) with a specific condition I would do a for loop with an if statement checking for the right value. This works great of course, but its a lot of code to do something that simple. We ask the arrayOfItems to give us the first value where the dictionary key exampleKey takes the value 3843. We simply ask the arrayOfItems to give us the first value where the its value equals 859. Note, in this code example we assume you will always have only up to 1 match. I’ve come to love this function and I think you will too. Hope it helps! I’m really enjoying going back to iOS development, expect more iOS posts this next couple of months as I’m ramping up on my next project. 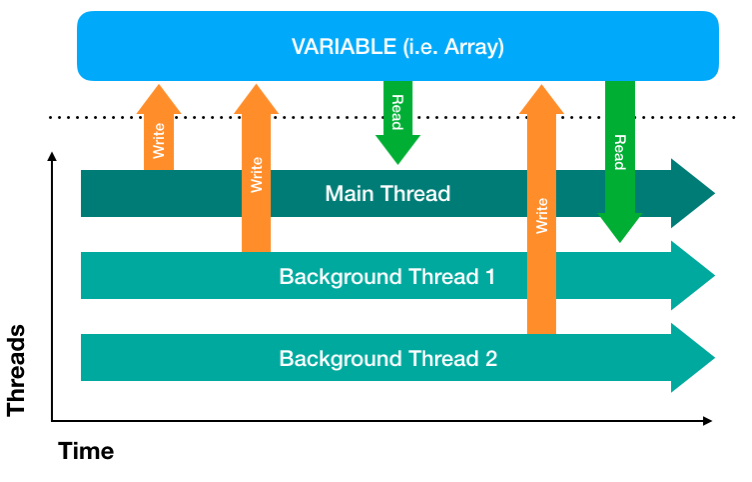 Working with background threads really helps improve the app responsiveness & the overall user experience. But, and it’s a big but, you have to be aware of multithread access conflicts. If you access/modify the same variable from multiple threads you’re prone to non-reproducible -seemingly random- crashes. 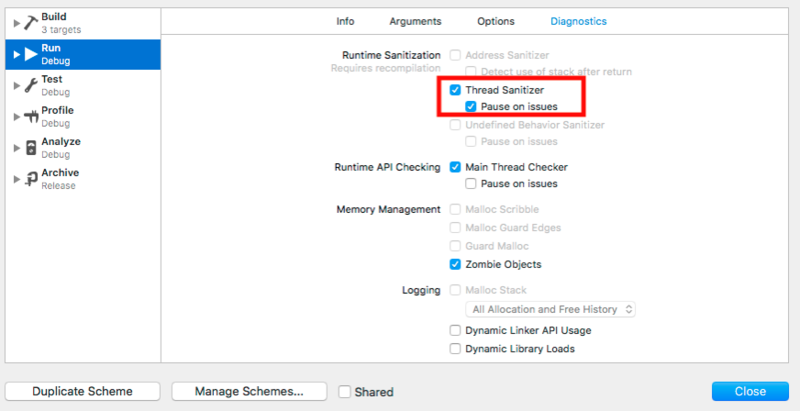 To help you find where you may have this variable access conflicts you should enable Thread Sanitizer & Pause on issues in your Run Scheme settings. Xcode will highlight conflicts while the app runs, as it detects them. If you want to dig deeper in what the debugger can do for you there’s a great WWDC 2018 session worth watching. Once we have detected the variables that are being accessed from different threads it’s time to strengthen them. How to Address Multi-Thread Variable Access Conflicts? //Variable accessor that can be accessed from anywhere (multithread-protected). In this case I’m adding multi-thread protection to an array (arrayOfFeedItems), but you could do the same with any variable. This has been a fun learning experience for me, hope this post helps other with the same challenges. Some extra documentation if you want to dig deeper: Swift Access Races & Framework Dispatch.